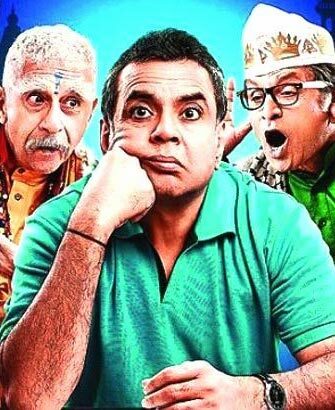 "Dharam Sankat Mein" is an official remake of The Infidel released in 2010. It falls in the same league of Ohh My God! and PK. When a movie is made in a league that already has two superhits should be almost at par or above the couple of movies made in the genre. But the problem with this movie is its mediocrity and poor way of telling the things that the makers wanted to. The intention of the movie is right and also the point that they wish to make becomes clearer to the audience but the problem is that the viewers are here to watch a movie and not get a point clear about our society. Either make the movie purely preachy or comic and the issue with the director here is that he is confused as to what way to chose to make this movie a success formula. In the dilemma, he fails to make a story that can become a talking point for cinema-lovers. It's very easy to forget. One reason why I readily agreed to watch this movie is Paresh Rawal. But seeing him do the same what he did in Ohh My God made me feel that I wasn't watching anything new but a bad version of one of my favorite movies. Paresh Rawal is the only saviour of this movie who tries to emerge strong in every scene. The way he tries to learn and excel in both the religions delivers few good scenes but Rawal couldn't add anything new in them as they lacked clarity. Similarly, Naseeruddin Shah has done certain amount of over-acting which takes away the essence of his presence in the movie. He even irritates you in some scenes which is very hard to believe but its true. Anu Kapoor is another actor who has tried well to save this movie but Alas! the fate of this movie was written in its direction and execution itself, actors couldn't do much to save it. Background music is fine. Screenplay is also easy to tune with. But the problem is the repetitiveness of the same question being asked again and again in every scene and dialogue. It's better to watch the other 2 movies mentioned above than wasting time in this one. That's all. I give this movie 1 star. Thanks for the review...main is Dharam Sankat Main kabhi nahi padungi. Im glad dt u've started reviewing all types of movies on blog.. atleast im saved..no plans for watching dis one..